Sunrise Video Productions is a full service film and video production company located in Miami, Florida and home of award winning Director Of Photography Joe LoMonaco and his crew. Sunrise has a large inventory of production equipment including the new Panasonic Varicam, a 24p High Definition Camera. SVP recently purchased the Varicam to add to its list of production tools available. 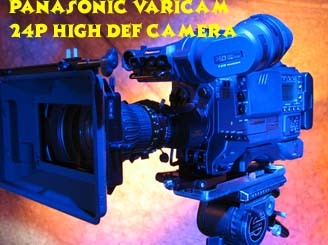 The Varicam is a High end production tool that has variable frame rates (4to60fps) to simulate the overcranking and undercranking technique of film, and also produces film like images. For your next production think High Definition and Sunrise Video.